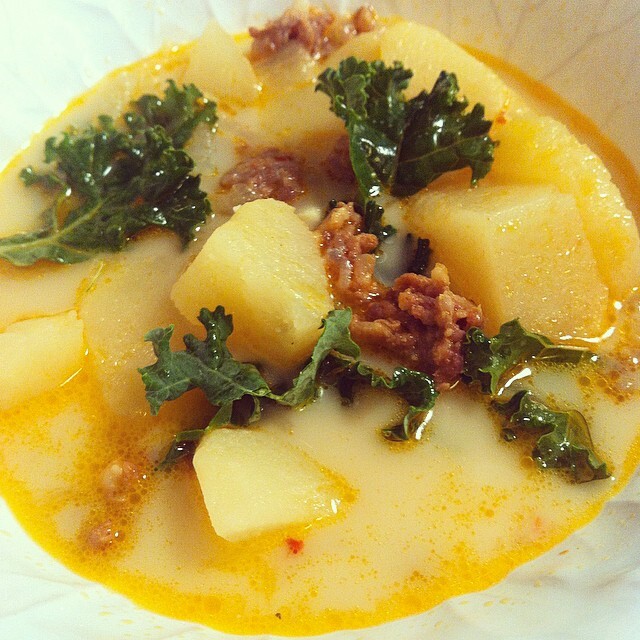 Zuppa Toscana recipes are all over pintrest. There are so many that I probably have about 6 different variations pinned in my “recipes to try” board because I cannot decide which one could be better. This winter my Zuppa Toscana recipe problem was solved. My brother-in-law’s wonderful girlfriend, Leah, told me about this amazing soup she and her sister made. I looked at the recipe on her facebook page and thought, “Alright this is it! If Leah thinks this one is the best then it must be the best.” I promptly deleted the other pins so as to not get confused with all the recipes. A few weeks later I made the soup. You guys, I cannot say it enough, this recipe is amazing! What is even more crazy is that we made it without bacon. The plan was to make a big pot of soup and take it over to my father-in-law’s house for dinner. Since he was eating with us I tried to subtract as much sodium as possible which meant the bacon had to go. I would describe this dish as creamy, hearty, spicy, and comforting. There is something to be said about a big ol’ bowl of soup that really does warm the soul. To the same pan add the onions and garlic and sauté for 10 minutes, until onions are tender. Stir in chicken broth and water. Bring to a boil. Once potatoes are cooked, add the whipping cream, cooked sausage and white pepper. Cook until heated through.